The CAP Basin Project has recently been transformed from a barren and dusty 70-acre tract into an award-winning, multi-use parcel of land. The original site had been used only one week out of each year during the FBR Open Golf Tournament. Now it also features a ten-field soccer/team sport complex and aids in stormwater detention. With Princess Drive dividing the sports complex, it became apparent that a bridge was needed to provide pedestrians with safe passage over the city street. The bridge, however, also needed to accommodate vehicular traffic for parking access during the popular FBR Open. Since over 7,000 vehicles use the complex for parking during the FBR Open, the bridge was designed for vehicular loading. Princess Drive, the road beneath the structure, has a depressed alignment. 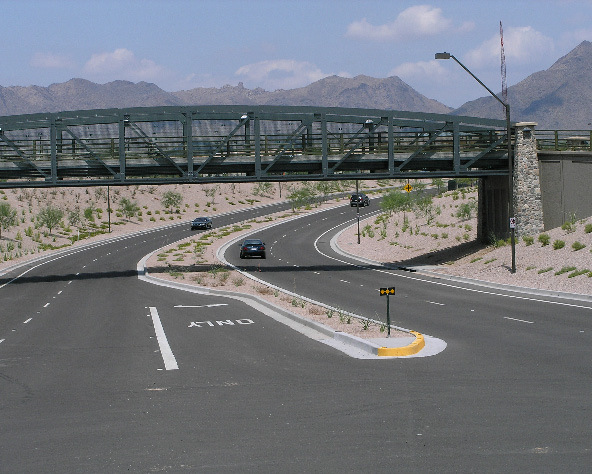 This allowed the bridge, situated at grade, to also provide easy and secure access for pedestrians crossing from one side of the CAP Basin Sport Complex to the other. “We are very pleased with the bridge” said Annette Grove, Senior Project Manager of Capital Improvement Projects for the City of Scottsdale. “It is a nice architectural element and serves as a landmark” The City of Scottsdale is also very pleased with the entire CAP Basin Sports Complex, and the project has won several notable awards.